Here's an intro to Scala functions, with a look at function syntax, and in-depth examples. Alex_ZvolinskiyScala combines two programming paradigms: object oriented and functional. As a result you get the best from the two worlds. From the one side you can describe models as objects, and from the other side you can apply functions to them. And as you may guess, it’s really awesome! Let’s discover the basics of Scala functions. Every time you need to perform some business logic or a simple action, start writing a function. With the help of functions you can do almost everything. Why only “almost”? Because to describe a model you still need use classes and objects. This function prints a greeting. The greeting contains a name which is passed to the welcomeUser function as a parameter. And what about that weird word Unit in the first line? It indicates that the function doesn’t return anything. After a function is declared we can use it. In order to call a function we need to write its name and pass parameters into it. //the output is "Hello, Alex"
The function above accepts an integer as a parameter and returns a boolean value. It’s logic is pretty trivial - it checks if the number argument is even or odd. At first you need to write a def keyword. The next step is to write a function name. If the function needs some arguments you write them in the brackets in a format name: Type, otherwise brackets remain empty. Then you specify a return type of the function. And finally you write a function body. What about a function which takes more than one parameter? 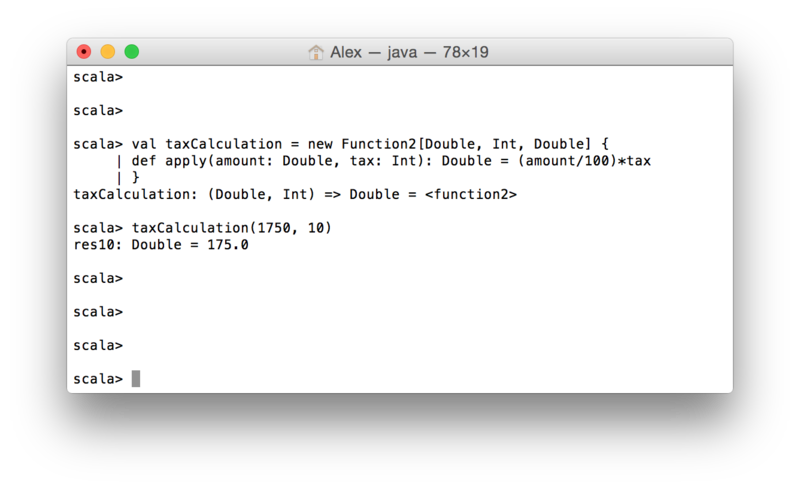 In the example above we create the taxCalculation(amount: Double, tax: Int) function, and it accepts two parameters and calculates taxes based on them. Pay attention to the function body. Its last line has a Double type (after calculation). A type of the last line (last expression) in the method is a type which a function returns. Scala allows us to omit a return type in a function declaration. But Scala knows what function returns due to type inference. We have discussed the type inference in the previous post about variables. As was said in the previous post, everything in Scala is an object. Functions are not exception. So actually, all functions which we have demonstrated in the current article are objects. Scala has some sort of abstractions for functions depends on number of arguments, starting from 0 (function without arguments) to 22 (yeah, imagine an ugly function with 22 parameters!). Functions in Scala are the smallest building blocks for business logic. They are really powerful and can be used in many situations for different purposes. In this post we overviewed the basics of functions and their syntax. But there are a lot of things which you need to know about them, e.g. what is function composition or how to pass functions as an argument to another function. Published at DZone with permission of Alexey Zvolinskiy , DZone MVB. See the original article here.